Jake's Famous Southwestern Hickory Dry Rub for Sale gives Salmon, BBQ Catfish, Talapia grill, swordfish grill, Chilean Sea Bass, Mahi-Mahi BBQ and almost every other kind of fish and unexpected jolt of flavor. This rub is so versatile it can be used the make the most succulent slow cooked ribs you've ever had. Natural herbs and spices combine in a savory blend with a hint of maple sugar, cayenne, chili powder, garlic, onions, smoked salt and more to permeate fish and meats, reaching deep into the hard to reach recesses of fibers, turning them into well-seasoned and highly sought after world class dishes. 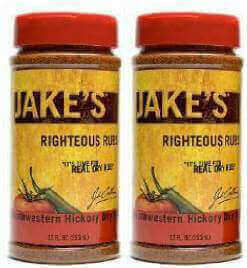 is a rich and delicious all natural New Mexico styled dry rub. Perfectly blended with New Mexico chile powder, cayenne pepper, cumin, Hungarian paprika and more. This delightful balance of herbs, spices and salts combine to enhance the flavor of beef, chicken, seafood, chops, steaks and a whole host of vegetables, potatoes, and snacks. Blended in our standard All natural form these dry rub spices and seasonings are free of preservatives, gluten, MSG and artificial sweeteners. The Southwestern Hickory Dry Rub is in a granule powder form and is sprinkled or spooned onto meat. The rub is slightly spicy as designed and compliments a number of fish and meat dishes without overpower the flavor of the dish. You can achieve amazing results by shaking on then wrapping the meat and letting it rest in the rub for about 45 minutes to an hour. Grilling is easy just place on a grill with medium to medium high heat at about 225 degrees for slow barbecuing or 275 degrees for quicker barbecue. Our Southwestern Hickory Dry Rub for Sale is now available in a Special 2 Pack. Make more hamburgers, more steaks, more chicken, more ribs and just plain more. Click Add To Cart and follow the process to Checkout to get these great Natural seasonings Now. Comes in squeezable container with spoon and sifter top. Container measures 2.5" diam. x 6" high. Larger sizes available. To get your started...For a limited time use PROMO CODE: Barbecue10 to get instant 10% Savings OFF our Southwestern Hickory Dry Rub for Sale and all of our other fine products. Grab Your Southwestern Hickory Dry Rub for Sale Today!